It is no secret that Los Angeles is a fairly park-poor city. 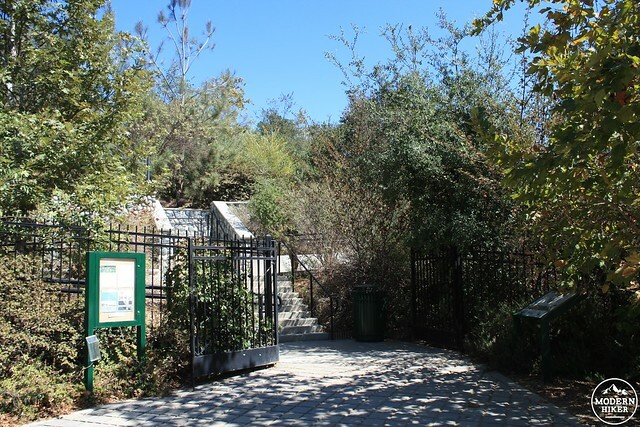 In the Trust for Public Land’s annual rankings of the park access of major cities, Los Angeles consistently ranks low on the list. This year, we placed 45th – behind Dallas, Las Vegas, and Cleveland. Sure, we’ve got the Santa Monica Mountains and Griffith Park, but if you don’t happen to live near those places it can be depressingly difficult to find some neighborhood green space. Thankfully, that is changing. Over the past few years, Los Angeles has made some baby steps toward rectifying that problem. 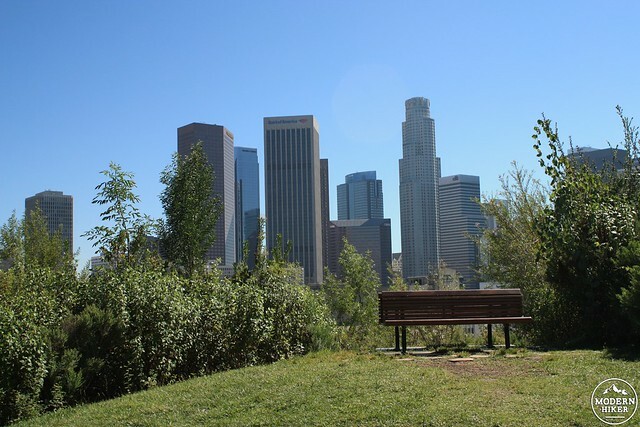 While some of the parks are nothing more than converted empty lots or “pocket parks,” Vista Hermosa Park is a shining example of a reclaimed urban park done absolutely, 100% correctly. Vista Hermosa almost didn’t even happen. The area was slated to be part of a massive educational complex, but the fact that it sits over both an old oil field AND a fault line put an end to that. But the Mountains Recreation and Conservation Authority stepped in, held extensive meetings with the neighborhood to find out what they wanted, and hired a top-notch local landscaping firm to deliver their vision. The end result is a gem of a park – one that manages to fit soccer fields, meadows, playgrounds, picnic areas, and stunning native plant landscaping in its 10 and a half acres. 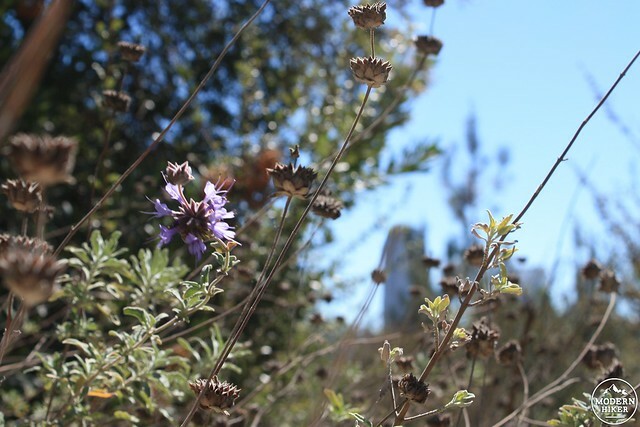 It’s just a stone’s throw from downtown Los Angeles – and in fact features one of the best views of downtown you’ll ever get – but a slow stroll through this park feels like you’re miles away in the Santa Monicas or San Gabriels. The first thing you see when you arrive at Vista Hermosa is a welcoming entry gate that is absolutely covered in green. I had the chance to tour the park with the MRCA staff, who explained the landscape architects designed the entry way with a mix of native and popular local non-native plants, then as you get deeper into the park it becomes overwhelmingly native. It’s done this way so that new visitors to the park – who in many cases have never been to a park before, let alone our local mountain ranges – can see a few familiar plants before getting close to some incredibly fragrant natives. Walking along the low, sloping sidewalks that slowly crawl up the first hill, you’ll pass California sagebrush and white and black sages, as well as laurel sumac, California Sycamores, ash trees, willow trees, coast live oaks, and Freemont cottonwoods in various stages of maturity. 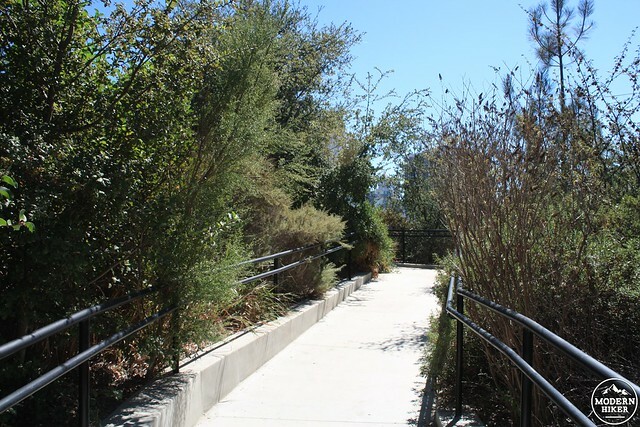 Not only will you be able to smell all those wonderful scents, but the tall native grasses and shrubs in this section of the park can totally block your view of the surrounding cityscape. It’s easy to imagine you’re deep in the Santa Monicas here, and not 0.4 miles from the 110. 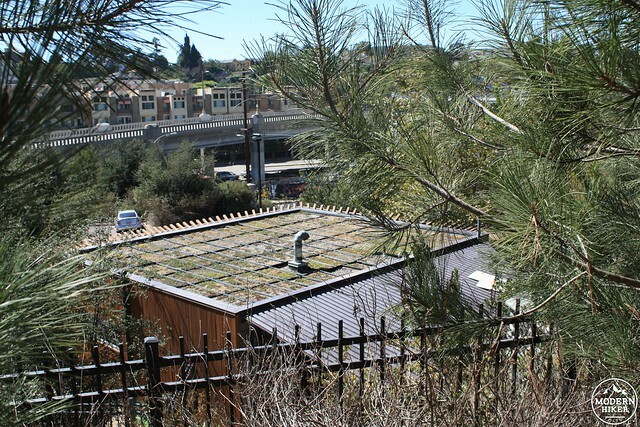 As you continue your visit, you’ll notice some of the park’s other features – the visitor center / administration building has a rooftop garden, there are picnic tables and secluded groves at nearly every turn. There are more conservation features in this park that you may not notice at first glance, too. The entire park is its own self-contained watershed. Every surface in the park is water permeable – from the parking lots to the decomposed granite walkways – and they all allow water to seep into the ground below. The nearby soccer field is synthetic turf that requires no irrigation but this, too, allows rainwater to sink into the ground. Additionally, every park drain flows into an underground cistern underneath the lower parking lot – overflow irrigation and rainwater are then stored and used to water the park during the dry season. 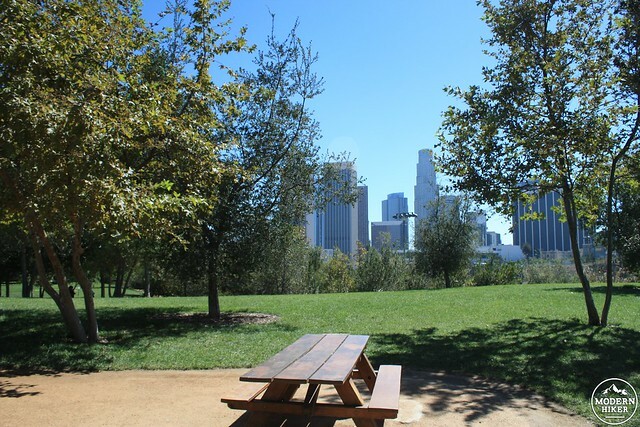 A moderately sized clearing provides you with your first glimpse of the grassy meadow area, along with some of the towers of downtown Los Angeles. Behind you is an artificial wetland area that also serves as a meeting place for the park’s extensive, free programs – including campfire talks where residents can get a taste of camping (and S’mores!). 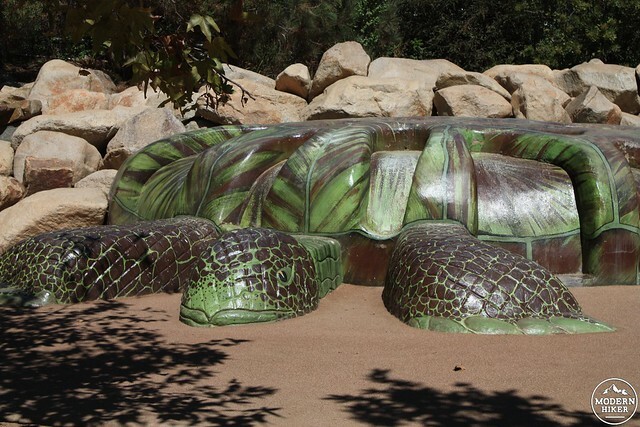 On the eastern end of the park is a children’s play area with soft ground and some fun, scramble-able sculptures of tortoises and rattlesnakes, as well as a park bench with what may be one of the best views of downtown Los Angeles in the city. As the park’s main trail turns back toward the west, you’ll be in view of the Edward Roybal Learning Center School, whose students often visit the park on their breaks. The trail here is quiet and easy, traveled by the occasional jogger or dog-walker. 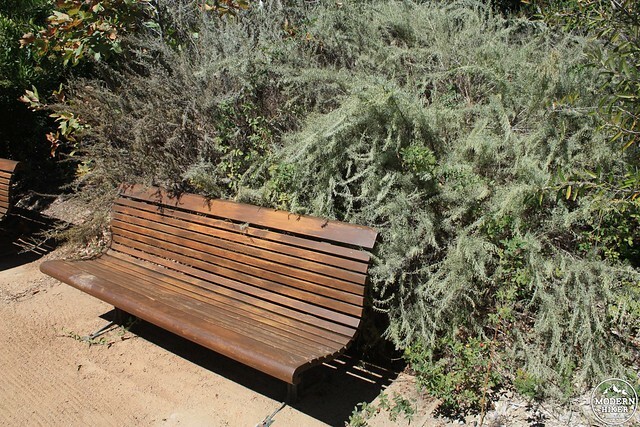 Be sure to take your time strolling through the area – and I recommend stopping on my favorite bench – this one that’s almost completely surrounded by a canopy of sagebrush. Once you return back to the gate, you may find yourself wanting to walk the park again – maybe because the path is so short, but more likely because the park itself is just so wonderful. 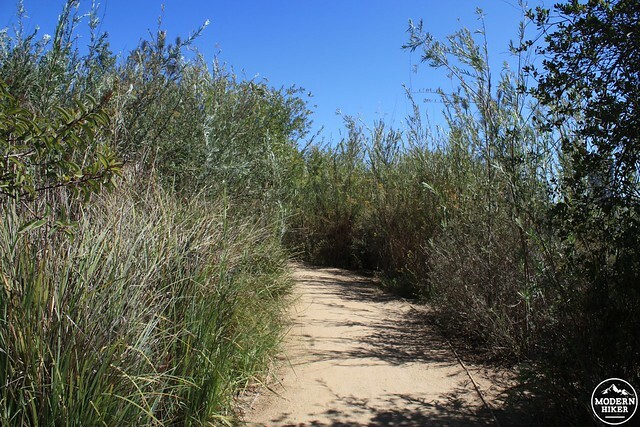 Vista Hermosa Natural Park hosts a variety of programs year-round, including free shuttle busses to the beach and trails in the Santa Monica Mountains. Be sure to check the Events Calendar on the Mountains Recreation and Conservation Authority page. Excellent. The park is well-maintained and paths are clearly marked. 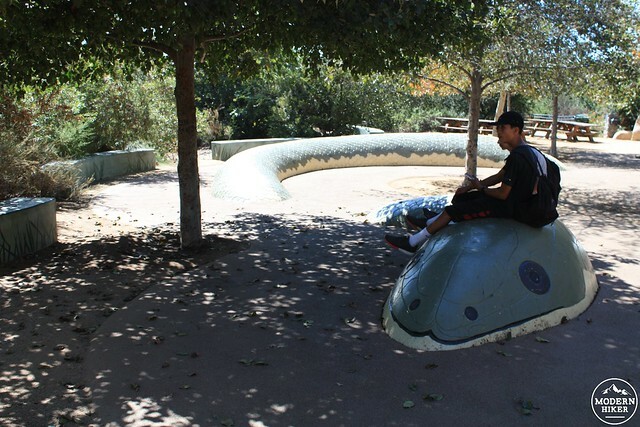 Vista Hermosa Natural Park is located near the intersection of the 110 and 101 in Historic Filipinotown. Free parking is accessible from Toluca Street north of 1st / Glendale, and street parking is also available. Vista Hermosa is also a short walk from Metro Lines 14 and 37's stops at Beverly / Belmont or 1st / Beaudry. Metro Lines 10 and 48 stop at Temple / Boylston, a few blocks from the north entrance.